The Soneva Jani arrivals dock. A wave of new properties prove that nowhere else combines sea, sand, and splendor quite like these islands in the Indian Ocean. From the headlines, you wouldn’t guess that the Maldives is an excellent place to go in 2017. This island nation of just 375,000 citizens, spread across 26 atolls in the Indian Ocean, has come in for a tough reckoning of late, and not without good reason. Corruption charges have plagued the government since former president Mohamed Nasheed, elected in 2008 in the country’s first multiparty democratic vote, was ousted in 2012 and briefly jailed on “terrorism” charges, in what his supporters called a military coup. (He eventually sought asylum in the United Kingdom.) The Maldives is still a democratic republic, but Islamic law plays a major role in both government and society. And when the British Commonwealth threatened to suspend the Maldives last September because of the country’s increasingly poor human-rights record, current president Abdulla Yameen responded by voluntarily withdrawing—making it only the fourth country in the 52-nation assembly’s history to do so. And then there are the country’s environmental challenges. With a national average altitude of just four to six feet above mean sea level, it’s conceivable that, if polar ice melt continues on its current trajectory, by the end of the century a good deal of the Maldives could be underwater. But it’s far from all bad news here. Environmental protection is still high on the government’s priority list (the Maldives was quick to ratify the Paris climate agreement), and tourism thrives (more than 1 million visitors came in 2016). The prodigious physical attributes that have long lured honeymooners and sybarites—that amazing sea, displaying the full color-wheel range of blues; those powdery white beaches—are still present and accounted for. If you’re keen to see marine life, from thumb-size anemonefish to giant manta rays, it’s here in an abundance found in few other places in the world. And if you want to appreciate (or have your kids appreciate) with an equally rare immediacy how imperiled that bounty is by pollution and climate change, the Maldives is one of the best places on the planet for such a field lesson. This past year, a raft of new resorts—from the Noonu Atoll in the north to Dhaalu in the south—have opened, each with its own take on the castaway luxury that has made the Maldives famous. Chances are there’s a singular escape for nearly every type of beach-seeking traveler. 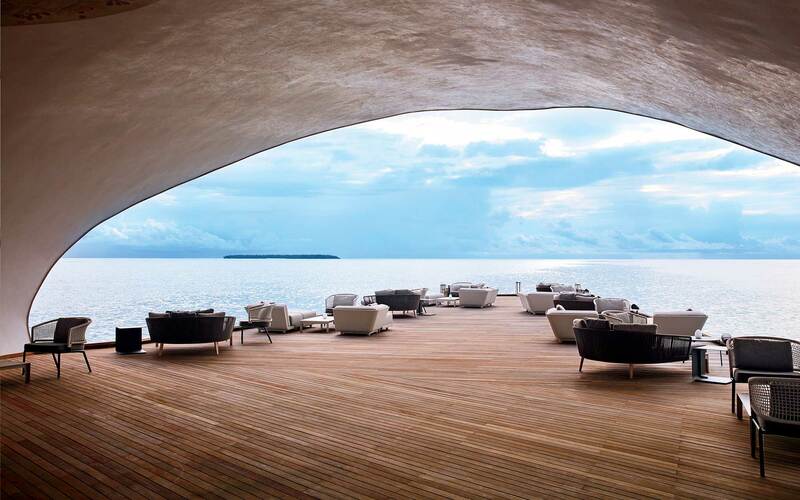 Deck seating at the St. Regis Maldives Vommuli’s Whale Bar. Just a 45-minute flight by seaplane from Malé, the capital, lies the newest member of the St. Regis portfolio, which is set on the private Vommuli Island—diminutive at 23 acres, dense with palms and pandani, and easy to circumnavigate on foot along neatly kept sand paths. Seventy-seven palatial villas are spread across the island and along the small lagoon that extends to its north. The Singapore-based architects, WOW, wanted to reference the famous marine environment through the buildings’ design: hence the overwater villas, their subtly sloping roofs clad in silvery shingles, evoke manta rays powering through the sea, and the long, overwater Whale Bar takes the unmistakable shape of a whale shark, its far end open like the massive fish’s mouth to allow for prime sunset vistas. St. Regis hotels often celebrate the opulence of the brand’s Gilded Age New York flagship. At Alba, the excellent Mediterranean restaurant overlooking the infinity pool and beach, the materials on display (exotic stone, mullioned glass, chandeliers) might seem at home in Italy or the French Riviera and out of place in the Indian Ocean, yet they somehow make sense. Certainly at night, when Alba is softly lit and irresistibly pretty. (I’m not sure a marble-clad bathroom in an overwater wood villa will ever feel 100 percent right to me, but the aesthetic effect is admittedly lovely.) Just down the beach is Crust, a sand-floored, six-table, open-air joint that turns out killer pizzas and grilled bruschettas, nothing else, and that is perfection. Likewise the one-bedroom, A-frame beach villas, with their 20-foot-tall picture windows overlooking private plunge pools. 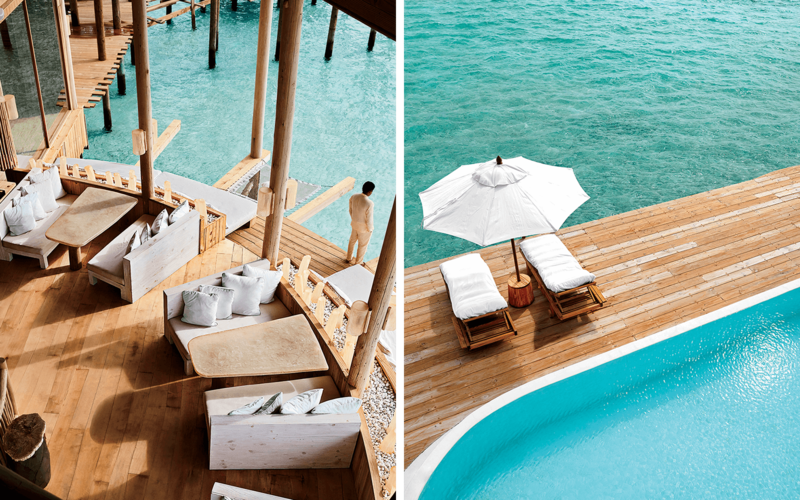 Left: Reception and guest villas at the St. Regis Maldives Vommuli Island Resort. Right: The master bath in the Water Villa at Four Seasons Private Island at Voavah. There’s an exceptionally cool fitness-recreation complex at the island’s center, where a naturopathic doctor administers acupuncture, and manicures and blow-drys can be had in the jewel box of a beauty salon. The main spa, which specializes in ayurveda-inspired treatments (as well as serious ayurvedic detox programs, overseen by a staff doctor), is a stunning construction, its weaving jetties leading to ultra-private treatment suites, each with an alfresco bath. What St. Regis seems to get right everywhere is service, and Vommuli is no exception. Starting with my airport transfer, where a video of my butler welcoming me played on an iPad in the car ride, through to the iced watermelon juice I was brought as refreshment for my flight out, there was a warm, highly competent interaction at most every turn. Doubles from $1,770. Meanwhile, the resort’s 24 overwater villas are open for business, strung like charms on a bracelet along an undulating boardwalk that extends from the main island into the lagoon. These are punctuated by a multistory complex known as the Gathering, which holds two restaurants, a bar/lounge, a boutique, a fitness center, and a mini spa. Like its predecessor, Soneva Jani favors “soft” luxuries (exquisite organic food, space, privacy) and dispenses with overt ones (anything remotely resembling gilt or marble). The Soneva look is one that a friend once dubbed, aptly, “Flintstones chic,” characterized by organic shapes, natural materials, and a real inclination to delight. The villas’ timber walls and plank floors (sourced from Sri Lanka) are dotted with amoeba-shaped portholes peeking onto the horizon or the aquamarine lagoon below. There are daybeds on sturdy platforms, and sprawling indoor-outdoor bathrooms encircled by ingenious jalousie panels for privacy, with steps leading directly into the water. The one-bedroom villas have 20-foot-long infinity pools and second-story lounging areas, and retractable roofs in the bedrooms. The two- and three-bedroom villas have these, too, plus some have waterslides—yes, you read that right—spiraling from their upper floors into the lagoon. Left: Water access from the Gathering at Soneva Jani. Center: The beach at the St. Regis Vommuli. Right: The living room of the Water Villa at the Four Seasons Voavah. The Gathering is home to a Willy Wonka–esque enfilade of “cold” rooms, for ice cream, cheese, and desserts. A juice bar sits across a suspended glass bridge from a vast open kitchen, where the chef does omakasestyle meals based on guests’ proclivities. Next door is a circular dining platform, with a central oculus from which a massive telescope emerges for evening stargazing sessions to enjoy between courses. Soneva Jani has a way to go before it’s completed, but what was up and running when I visited more than delivered on the whimsical, indulgent experience that has long been Soneva’s stock-in-trade. Proof positive it pays not to mess with a successful formula. Doubles from $3,085. In short, and with apologies to Finolhu’s branding team: it’s a party island. Finolhu is the second resort from the Small Maldives Island Co. (the other is the more family-centric Amilla Fushi, which opened in 2014), owned and operated by two Australians, one of whom earned his Maldives chops as general manager of the One&Only Reethi Rah. Their concept was to import the jet-set glamor of Mykonos and St. Tropez to the Indian Ocean, flagrantly eschewing the local thatched-roof building vernacular, along with most every other conventional reference to local culture, in favor of man caves, mermaids, and lots of out-of-context antique signage. Fair enough, and to each his own. But the thing is, Finolhu is in the Maldives; specifically, in the Baa Atoll, one of only three UNESCO-designated World Biosphere Reserves in the Indian Ocean—which made the zeal with which its creators proselytized about the high-flying hedonism of their vision, to the exclusion (at least on my visit) of any mention of the country’s environmental and wildlife issues, feel slightly tone-deaf. That said, Finolhu has some notable things going for it—starting with its prices. With one-bedroom beach villas coming in at around $850 in the low season, it offers better value by local five-star standards. The rooms themselves are sleekly designed, with wide private patios laid with Balinese tiles, enormous beds under pitched, palewood ceilings, and gorgeous outdoor bathrooms, those in the beach villas bowered in palms and bougainvillea. The food was creatively conceived and beautifully presented, from the crunchy soft-shell-crab tacos at the Fish & Crab Shack to the poke and heavenly spiced crispy eggplant, vivid with roasted chiles, at Kanusan, the Pan-Asian restaurant. And there’s the island itself, whose windswept sandbar should, on an early-morning ramble, fulfill just about every permutation of castaway fantasy that’s out there. Left: The Gathering is the communal centerpiece of Soneva Jani. Right: A pool at the resort. For Americans, Finolhu’s fun but very site-unspecific offerings ultimately lead to one question: Why come all this way for something you can arguably get in Ibiza, or Turks and Caicos—or South Beach? On the other hand, what is working here works well indeed. Those in the market for a good old time—as opposed to an edifying local experience— now know where to book. Doubles from $850. Private islands are somewhat of a thing for 2017, and the Maldives is full of them. But this latest retreat in the northern Baa Atoll from Four Seasons—which already has two best-in-class Maldives resorts, Kudaa Huraa and Landaa Giraavaru (the latter located just two miles from Voavah)—is the real deal: an exclusive private island that sleeps anywhere from two to 22 people, has its own chefs, staff, spa with therapists, and 65-foot-long PADIequipped motor yacht with a dedicated divemaster. Voavah, which opened in December, offers once-in-a-lifetime luxury for people who are celebrating something big or a holiday redoubt for those wealthy enough to not even blink at the $36,000-a-night rate. The rooms have been cleverly configured in three separate villas to accommodate friends, multigenerational families, or entourage-heavy celebrities/oligarchs/tuhao (Chinese nouveaux riches). The Beach House has the main living and dining areas spread across its wall-less ground floor and richly appointed mezzanine suites above. 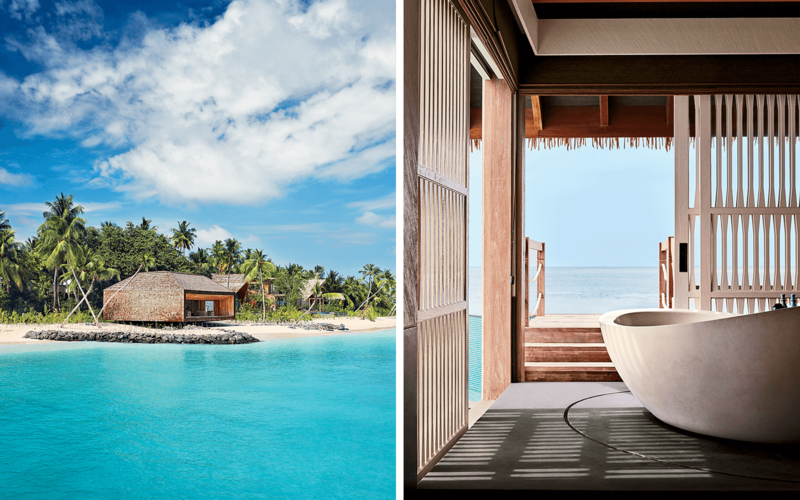 A three-bedroom villa at the island’s northern end has a master suite with a truly dreamy 200-degree sea-and-sand view; the two-bedroom overwater villa, at the island’s other end (Voavah measures only about 1,000 feet long by 350 feet wide) has one of the more spectacularly photogenic conflagrations of infinity pool and horizon I’ve ever seen. But what Voavah is really about is total personalization. Pancakes at midnight? Of course. Impromptu cruise on the Summer to snorkel among manta rays—which, in late summer, convene in Hanifaru Bay by the hundreds—with one of the researchers from the Manta Trust, a charity based at the nearby Landaa Giraavaru? Ready when you are, ma’am. Pizza-making class for the kids, while the grown-ups enjoy sundowners on the sandbar across the channel—perhaps with a traditional dance performance? Done—just give them a day to organize it. That guests can also partake of any of the top-notch restaurants or services offered at Landaa Giraavaru only expands the territory. But when you’re standing ankle-deep in opalescent wavelets in the morning, looking northward to a constellation of uninhabited islands, a soaring expanse of milky-blue sky, and, beyond, the ocean—luxury at its most elemental and rare—it’s hard to imagine needing anything else, ever again. From $36,000 per night, all-inclusive. Velana International Airport, located on Hulhule Island, is the main international airport in the Maldives, reachable via cities like Frankfurt, Istanbul, Doha, and Dubai. Many resorts can provide air or boat transfers to their properties. December through April, when the weather is dry and the humidity is low, is peak season for travelers. Low season is between May and November, which typically means more rain but cheaper rates.